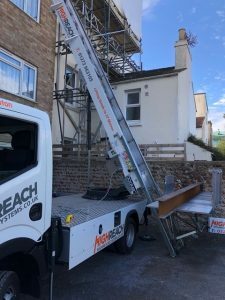 High Reach Systems began as a furniture hoist company, but in the last year we have received more and more calls from construction companies seeking our help to left heavy materials and machinery to places of height. For many companies it doesn’t make financial sense to hire cranes or lifting systems on a long-term basis – particularly for smaller jobs such as loft conversions. 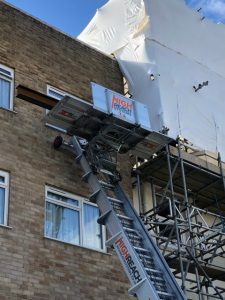 In these situations, High Reach System’s external lifts are ideal for hire on an ad hoc basis. We get the heavy lifting jobs done, in a swift and cost-effective manner, so builders and developers can get on with the job in hand. Last week, a construction company requested our services to lift 4 x 120kg RSJs to a development on the top (3rd) floor of a property in Central Hove. Access was tricky, and without the correct hoisting systems it would have taken precious time and manpower to raise the steel beams to this height. We used our Nissan truck mounted elevator which is capable of lifting to 28-metres with a maximum of 400Kgs per lift. It made easy work of each RSJ, lifting them to the correct height allowing the builders to safely reach them and slide them onto the upper scaffolding floor – all in UNDER 1 MINUTE per RSJ. Unable to access the rear of the building directly, we were able to get within a few meters using the car park of the neighbouring building. We used their wall to support the ladder head and managed to get within inches of the scaffolding platform to ensure the builders could reach the steels safely. Able to make small and precise adjustments with our lifting systems meant we could raise the platform to the exact height of the scaffold, ensuring the smoothest possible transition. A job which took no more than 30 minutes in total would have taken the company a few hours, potentially causing injury to individuals and damage to the internal or external structures of the building. It is always satisfying to serve another happy customer, and we can see this side of the business growing exponentially with construction continuing to be one of the key sectors experiencing growth in the city of Brighton and Hove. We can offer a vast array of hoisting solutions for the construction industry: wood flooring, pallets of tiles, heavy machinery, masonry – we have found a way to lift them all, and our trailer mounted lifts are capable of fitting into exceptionally narrow gaps. AGS One are proud to have been awarded OHSAS 18001, ISO 14001, and ISO 9001 accreditation for our management systems by BSi. AGS One are also one of the few RISQS Five Star suppliers and FORS Silver accredited.